So as I was watching Supernatural (the TV show) the other day, they had a killer clown in one of their episodes. Even without this episode, I have always wondered: Who the hell though clowns were a good idea?! Doing some digging around, I found out that they try to appeal to people wanting laughter and are meant to make a fool of themselves. A clown’s attributes include playfulness, lacking in respect with a sleeve full of surprises. This sounds a lot like a medieval time jester to me, which some sites have said that they were the precursors to clowns. So I can probably explain the differences in these three main types of clowns, but I am not going to. Basically, from what I can tell, they all look kind of scary. Seriously, this is supposed to make people laugh? If I see past the clown makeup and costume, what they do may coax a laugh from me– better yet, they should just do funny stuff in a less scary costume and I am sure I will enjoy their skit/routine a lot more. What I also cannot understand is how clowns made it to children’s birthdays. I guess some adults could not think of who better to amuse their kids than a man/woman dressed up in baggy, outlandish clothes, with a face full of makeup. See, I get the part about making balloon animals and making funny incidents happen, but again, the way clowns are typically presented do not appeal to me. I think it is because clowns have their features exaggerated. Huge red smiles, raised eyebrows, the signature red nose– altogether it creates a mask, covering who is really behind all that makeup. It seems to say that with this mask on, they can do whatever they want and the consequences can be forgotten. Plus, their main aim is just to make you laugh, so they will do what they have to. Maybe it is because I grew up in a time where clowns are used quite frequently in horror movies and stories? We have Stephen King’s It, the Joker from Batman and then there are episodes from TV shows such as Supernatural. To me, clowns are just unsettling. 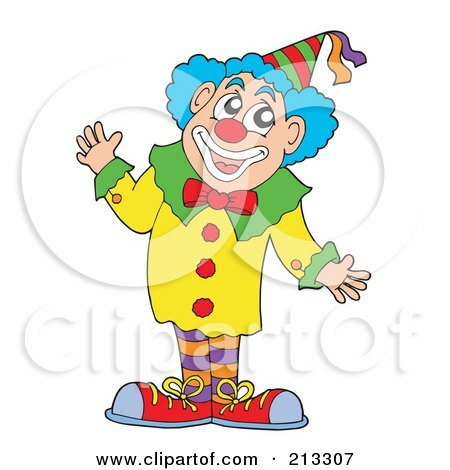 I simply cannot find a picture of a clown that look genuinely nice and ‘funny’ to me. What are your thoughts? I tried hard to find a picture of a cute clown. But I still think that they could have come up with something that looked less scary. You don’t think THAT picture was creepy?! “why” as in “OH DEAR LORD why…” do clowns exist. Ahaha! The figures is of a mischievous demon in old French passion plays. The first known appearance on stage of a Harlequin figure is dated to 1262, the character of a masked and hooded devil in Jeu da la Feuillière by Adam de la Halle, and it became a stock character in French passion plays. But, and here’s a creepy thing, the earliest record of such a thing is from the 11th century, in the writings of Orderic Vitalis, who recounts that he was pursued by a troop of demons when wandering on the coast of Normandy at night. These demons were led by a masked, club-wielding giant and they were known as familia herlequin. This medieval French version of the Germanic Wild Hunt, Mesnée d’Hellequin, has been connected to the English figure of Herla cyning (“host-king”; German Erlkönig).Hell-Equin was depicted a black-faced emissary of the devil, roaming the countryside with a group of demons chasing the damned souls of evil people to Hell. The physical appearance of Hellequin offers an explanation for the traditional colours of Harlequin’s red-and-black mask.